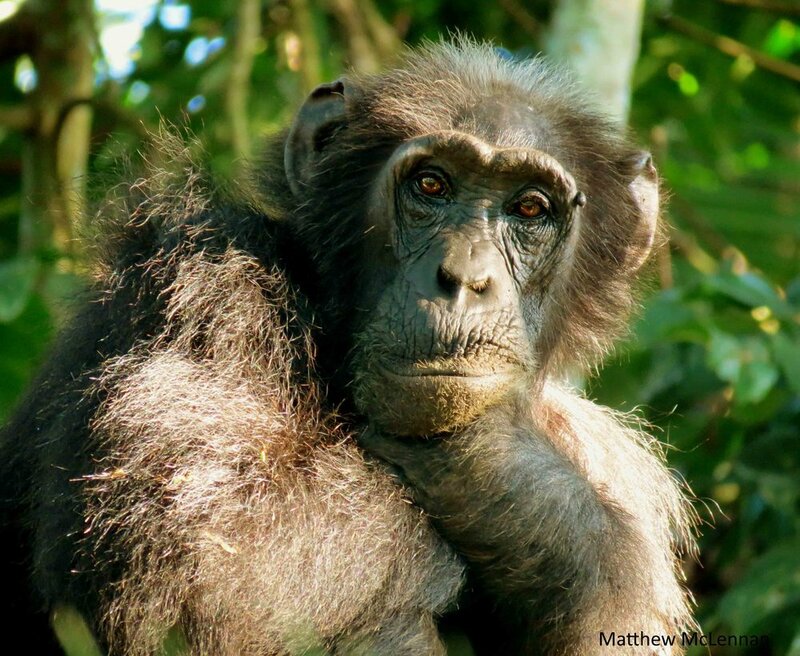 Editor’s Note: We at ChimpSaver think one of the best ways to Take Action is to support conservation experts and projects like Dr. Matt McLennan and the Bulindi Chimpanzee & Community Project. Here is an excerpt from the field, first posted last spring 2018, by Dr. McLennan. I’d like to thank everyone for their kind words and thoughts following the death of Bulindi’s oldest and much-loved chimpanzee, Joyce. Her untimely death after she was injured by a farmer’s trap, affected all of us at the Bulindi Chimpanzee & Community Project profoundly. Ultimately, Joyce’s story is one of resilience and survival. She was, minimally, in her mid- to late-forties when she died – old for a wild chimpanzee – but she might have been in her fifties. In a landscape like Bulindi where chimpanzees must learn to survive in the midst of people, a chimpanzee doesn’t reach such a grand age without being smart and resourceful. We’ve known Joyce since 2012 when we began monitoring the chimpanzees daily. What changes she must have witnessed in her lifetime! Decades ago, when Joyce was young, her forest home was thick and dark, with an abundance of wild foods. The chimpanzees stayed inside the forest and had little contact with their human neighbours. That all changed over the last 20 years: the big food trees were logged for timber, and the forest was cleared to the river banks and swamps as a swelling human population sought fertile land to plant crops. The chimpanzees lost almost their entire forest home. Now the chimpanzees turned to the village gardens to find food. Besides her forest, Joyce also lost many members of her community, as conflicts with villagers grew and people and chimps were forced to compete with one another. Joyce was a prominent character in Bulindi, always at the heart of the group. Unencumbered by dependent offspring (Joyce last gave birth more than a decade ago), she often led the group, navigating dangerous roads and crossing farmer’s fields, avoiding people as best she could. But she could also be feisty in unwanted encounters with humans. We think she was probably alpha female in her former years. Despite having no reason to trust humans, in recent years Joyce became especially trusting of our research team, satisfied that we meant no harm to her or her family. In her last year, Joyce’s eye-sight deteriorated; probably this contributed to her failure to spot the trap (though traps are usually concealed by vegetation). She became less active, spending long hours of the day napping in comfy nests. This is how her long life should have passed: quietly and in comfort. The cruel circumstance of her death was undeserved and unfair. Many villagers in this region live in poverty and depend on farming for their livelihoods. Crop losses to animals can be devastating for farmers. Still, the vast majority of villagers agree that using ‘man-traps’ to protect crops is wrong, especially given the known danger to chimpanzees (sadly, Joyce is the latest of several chimpanzees known to have died from traps at Bulindi). Although she’s gone, Joyce’s legacy will live on in Bulindi. Genetic analyses by Dr Maureen McCarthy and Jack Lester (of the Max Planck Institute for Evolutionary Anthropology, Germany) revealed that Joyce is almost certainly the mother of Bulindi’s long-term alpha male, Sylvester, who has sired many infants in the community. The Bulindi Chimpanzee & Community Project is now more committed than ever to ensuring the survival of Joyce’s children and grandchildren in Bulindi. And we’ll work closely with villagers and conservation partners to raise awareness about the dangers of traps – which are illegal in Uganda, as well in inhumane – in the hope that no more chimpanzees have to suffer. Thank you to Dr Joshua Rukundo (Chimpanzee Sanctuary and Wildlife Conservation Trust) and Dr Caroline Asiimwe (Budongo Conservation Field Station) and their teams for their effort to help us find and treat Joyce; and a special thank you to the Bulindi Chimpanzee & Community Project field staff and researchers for all they did to help Joyce in the last week of her life: Dr Marie Cibot, Georgia Lorenti, Tom Sabiiti, Jacqueline Rohen, Moses Ssemahunge, Vincent Kiiza, Lorien, Benjamin Hintz and Alastair Bigger.